Invisalign uses a series of clear, removable aligners meant to straighten teeth without brackets or wires. The aligners can be easily taken out and placed back in which makes everything from eating to brushing a breeze. Advancements in Invisalign’s technology have made it possible to correct a broad range of difficult situations such as: deep bite, overly crowded teeth, widely spaced teeth, open bite, crossbite, overbite, and underbite. With the introduction of iTero®, manual impressions have been replaced. An intra-oral scanner creates fast, precise 3D digital images of your teeth that are used to develop your personal treatment plan. Clontarf Orthodontics designs a precise, personalised treatment plan, showing you the exact movements of your teeth and how long your treatment will be. 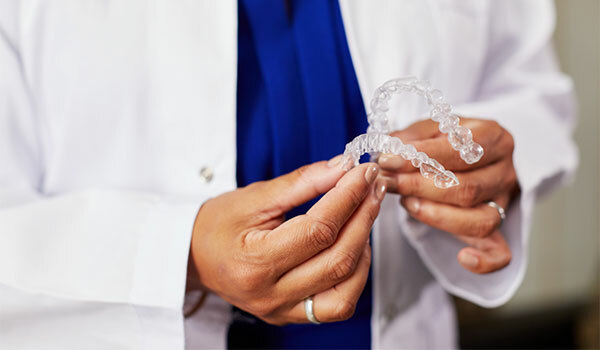 Your aligners are then printed using 3D printing technology ensuring highly accurate, customised aligners. You won’t have to alter the food you eat in the slightest. Eat the same food with no limits. Quickly unclip the aligners and brush your teeth like normal. Invisalign aligners are practically unnoticeable. You can continue to smile in social events while Invisalign changes your smile without interference.